Providing you the best range of batching trolley wheels and v groove wheels with effective & timely delivery. Being the leaders in the industry, we offer Batching Trolley Wheels to our clients. They are available in different sizes. Their weight ranges from 85 kilograms to 1850 kilograms and are presented at the best rates in the industry. Additionally, they can be used in in-house Textile box batching and other industrial applications. Our company is dedicatedly engaged in manufacturing and exporting a unique range of V Groove Wheels to our prestigious clients. 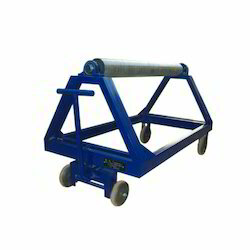 It is a rope pulley and is easy to scroll using ropes of different thickness. This wheel runs smoothly and is highly appreciated for its long life and non breakability property. They are available in different colors and specifications to meet the client’s requirement.